French Piano is an afterschool music program dedicated to bringing European music education to schools of Los Angeles. Since 2005, we have taught hundreds of students whose life has been enriched by the gift of European music education. Native from Paris (France), Pierre André first encountered film music at an early age and has, since then, shown tremendous passion for the medium. Later studying Jazz Composition and Piano at the American School of Music (Paris) before transferring to Berklee College of Music (Boston), Pierre André completed his Bachelor's Degree in Film Scoring with an original re-score of Ron Fricke's 70MM epic Baraka. Among his credits, Pierre André has orchestrated various cues on 20th Century Fox Worldwide box-office hit X2: X-Men United before scoring a diverse string of short movies: Verboden Te, Good Riddance (dir. Francis Moors), Bushido (dir. Hiroshi Komuro), The Last Days of Toussaint l'Ouverture (dir. Derick Alexander), The Road (dir. Aaron Kemp), o/one, Put It Away (dir. Shane Steinhart), The Last Drive (dir. Yves Martin), In Vitro (dir. Matthew Friedlander) and more to come. Formerly a Film Music Journalist, Pierre André has conducted interviews with more than 60 film composers and has written over 100 film music reviews. His texts have been published in publications such as SFX Magazine, Click-Track Magazine and the original TraxZone web magazine. 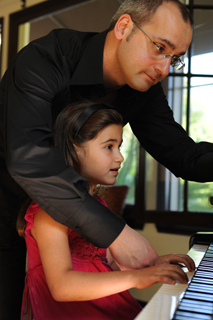 In parallel to his film career, Pierre André maintains a strong presence in the education realm with two ventures: The French Piano Academy, an afterschool program for elementary, middle and high schools of Los Angeles as well as The BH School of Music; a local music conservatory for the city of Beverly Hills. Pierre André currently resides in Venice, CA. © Beverly Hills School of Music. All Rights Reserved.